With QuickOPC, you can create OPC client applications that allow the selection of OPC data (OPC browsing) to their end users. The OPC browsing controls provide interactive viewing and selection features that can be combined with other controls on the form to achieve the desired functionality. You can simply drag on of the provided browsing control components from the Toolbox, optionally configure its properties, and it will automatically perform the OPC discovery and browsing, show results, and allow your users to select the OPC data they need. 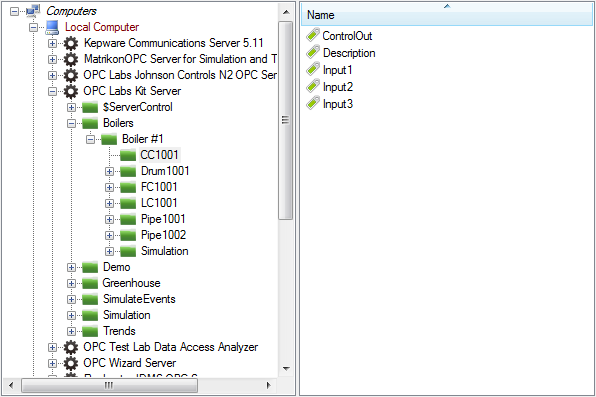 Browsing controls support OPC Data Access, OPC Alarms&Events, and OPC Unified Architecture. The functionality of the controls is some respect similar to the browsing dialogs. Unlike with the dialogs, you have full freedom in creating your own visual appearance and behavior of the form, in case that the standard browsing dialog is not enough, or when you need closer integration with other parts of your application. There are two different controls available: one control is for for OPC "Classic" (and OPC XML-DA), and then there is a separate control for OPC-UA. The control names are OpcBrowseControl and UABrowseControl, respectively. The controls can be configured to provide a tree view only, a list view only, or a combined tree view and list view. Browsing (discovery) is possible for computers (hosts), OPC server, nodes (items) inside the OPC server, OPC properties, OPC A&E alarm areas and sources, access paths, etc. When certain piece of information is not available by browsing, it can be entered manually. E.g. your user may add a known OPC-UA or OPC XML-DA server by entering its URL, or a hidden computer, etc. 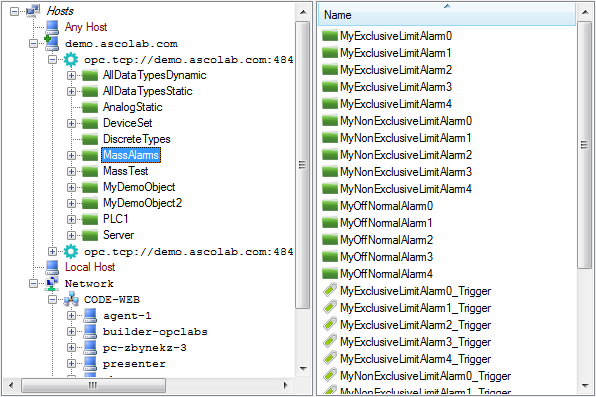 Single-select or multi-select mode: you can allow the use to pick just one node, or a set of nodes (in the list view). When placed onto a designer surface, the controls display just simulated data, without loading your system with unwanted OPC accesses and processing. 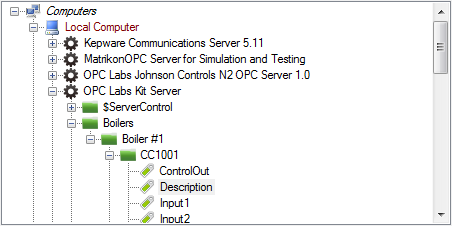 When you run your application, the controls obtain live OPC data. Alternatively, you can instruct the controls to display the simulated data in runtime mode as well (this is useful e.g. for user training in off-line scenarios). Examples of the controls in action are on the pictures below. Note that these are truly just examples; the flexibility of the controls allows many more combinations.